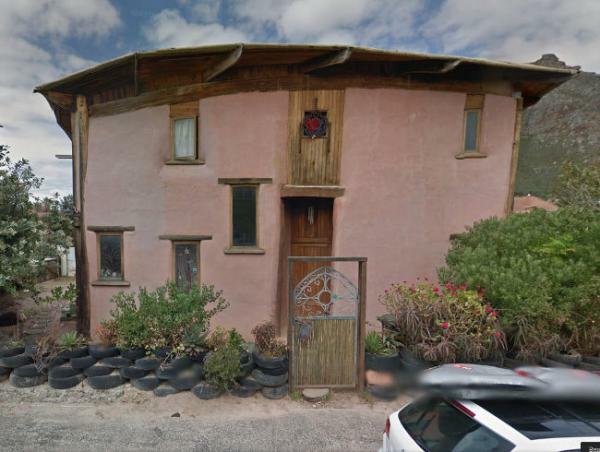 A family home/ B&B built like a traditional African home, out of organic materials – mud, straw, and wood; finished with natural sealants and eco-friendly paints. 200 metres from Muizenberg beachfront, in Cape Town. Private entrance, spacious triple bedroom with ensuite shower. Photo 1a: The Yarrows i.e. Simric and Carey, with a recent cob-building guest inbetween! This is at our front door and also shows our two daughters and our resident security system. 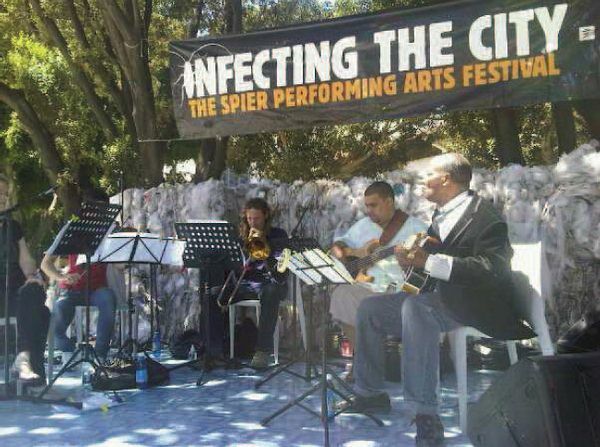 12 years, permanently in the suburb of Muizenberg. Longer in Cape Town generally. Jointly by Simric and Carey with occasional input from Ralph (who does not live permanently with us but has invested in the property). Privately owned - open to all paying guests! - though we also have occasional public open days for those interested in green building techniques. Muizenberg residents have been generally very supportive of this unique suburban green building and many took part in building workshops we ran during the building process, but we make our own decisions according to our own eco-conscious and financial criteria. Photo 1h: Local community workshop being run during the early phase of construction. 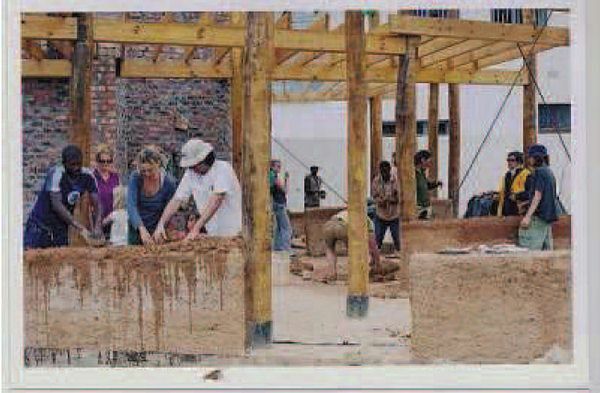 Cob walls are healthy and building is a lightweight experience thus enabling people of all ages from 3 to 93 to take part in the construction experience. Three (3), extra mattress possible on demand. Just guest area is 30 sq m, but guests have garden access too. Photo 2d: The property as seen from the garden. The guest room, which has a separate entrance, is seen top right. The rest of the house is our family home. Guests can access the garden, which is water-wise i.e. plants are indigenous or, where exotic, are not invasive or thirsty. Photo 2d2: A view of the guest bedroom showing single bed and double in background. There are a number of other pictures that we could show – perhaps more flattering but less immediately useful for "showing what's there". 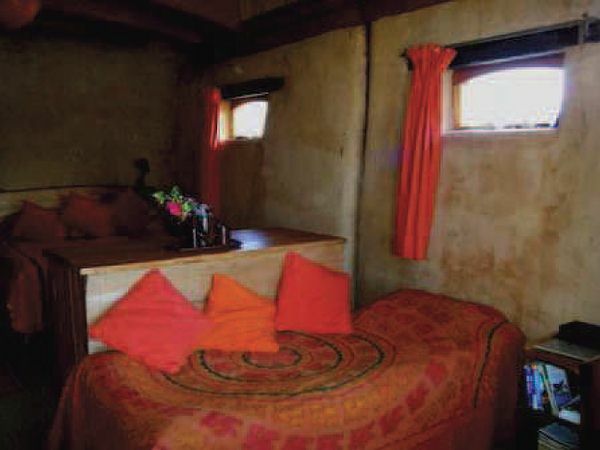 Thick mud walls, furniture made from reclaimed wood by local artisans, natural fibre furnishings, conscious reading materials with ethical local interest. just us at present though we would like to be able to offer more local work as we grow. We employed many locals during the construction phase and trained them in green building skills, they have gone on to work on other similar projects. 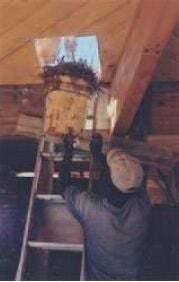 Photo 2f: Construction of roof, one of our employees during the construction phase, having just made a new insulation straw/mud mix for insulating the roof. Construction employees were trained in a variety of techniques and then moved on to work at other eco-building projects or other organic employment. Opening year - limited turnover, lots of capital set-up costs: ZAR 12 500 came in via the B&B. Net loss - around R40 000, covered by loans from our other private income. We are not exempt but have not made any profit yet. Photo2n: Part of our garden dedicated to fruit/vegetables. Figs, melons, garlic, lemon visible here. Some of these may form part of the breakfast (or supper) depending on what is fruiting. Garden herbs are more often a feature e.g. mint for water, basil for pesto. We also grow carrots, spinach etc. More will happen as the garden takes shape post-building site! The Western Cape, and South Africa as a whole, is lucky in terms of the range of fruit that is grown. Most of our organic fruit and fruit juice is from the Western Cape, bananas come from other parts of the country. Dairy produce, breads, spreads all locally sourced from organic sources. Herbal organic teas are also locally sourced. There is no organic coffee produced at present in South Africa but we source the nearest fair trade organic coffee – from Malawi. Organic breakfast cereals – granola is local, cornflakes imported as (despite huge corn plantations) no organic cornflakes is made locally. When in season. Our garden is small and breakfast products limited! See above. Not directly but we do shop at local organic co-ops for our breakfasts. R600 for two people (but we charge per person so 1 person takes the room for R300). Brown field site. Previous building on the site, demolished in 1960s, site empty ever since and placed in existing urban area. Also has beautiful mountain views, aesthetic appreciation for the environment is an important criteria with reconnecting our society with nature! Photo 3a: House site in urban area, mountain (and cloud!) in background. 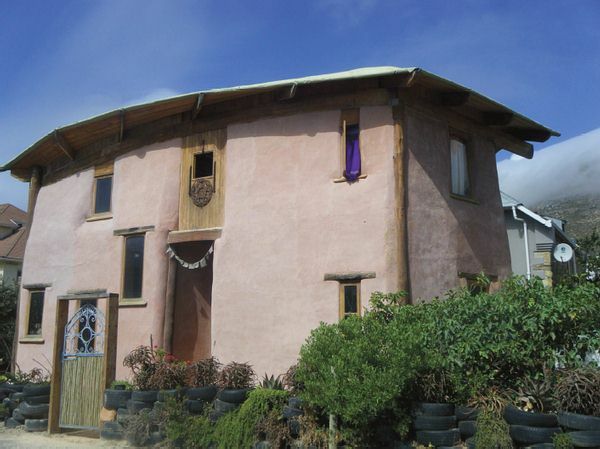 Materials include: cob (earth, straw) plastered with lime, sand, clay; wood which is either reclaimed (sleeper lintels), sustainably harvested and organically treated (local siligna joinery and pine) or invasive aliens that needed cutting for water-saving (bluegum poles). Organic, non-toxic finishes. Roof – wood, straw insulation, clay, and bitumen sheeting for waterproofing, strong enough to support a "living roof" in future. Our tyre "green wall" is also visible including local prickly plants as a water-wise, aesthetically elegant alternative to regular fencing. Front door faces exactly due east – lots of window light and passive solar design, see garden view for the amount of north light we get! Also local blacksmiths involved in creating the gate/upstairs movable window-frame etc. Use the greenest materials wherever possible. Use local labour and materials as far as possible. Push the regulatory bodies as far as they could be stretched in terms of eco-conscious construction! Design with an aesthetic sense that would provide a natural, healthy, passive solar, light and (on an esoteric level) “spiritually beneficial” home. 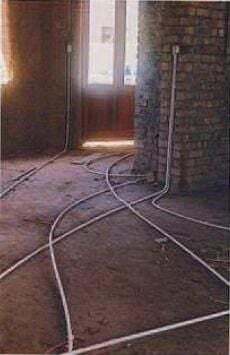 Electricity circuits designed to avoid creating electro-magnetic loops around dwellers in the house. Use of energy-saving light-bulbs. Photo 3c: Conduits designed to travel around house without creating electromagnetic loops. This picture is from before we poured a final cob/dung floor downstairs that covered them. Passive solar design and earthen construction has meant that even in midwinter we have an upstairs window we have been able to leave without glass i.e. open to the elements. We have plans for a slow-burning fireplace at some point but winters have so far indicated that this is not a priority. We have a solar water heater which provides most of our hot water. 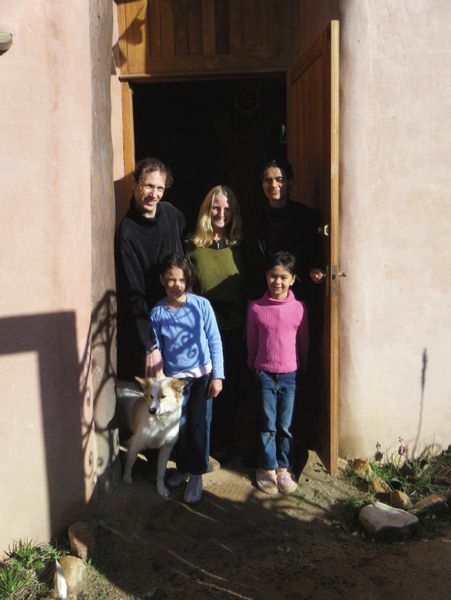 Natural cooling through breathing earthen walls. The house is cool in midsummer. We use only biodegradable products. Grey water system in place recycling water to the garden, plans for water tanks and roof garden in future years as funds allow. Gas at present - South Africa provides no option to have “renewable electricity”. Recycling - paper/cardboard/metal/plastics/glass - bin in guest room, we sort individually and then deposit regularly to the local recycling collection point. Compost including vermiculture worm bin for most vegetable waste, though some is still sent to landfill on principle that landfills NEED some vegetable waste to help the long term disposable materials to decompose. We use natural mosquito repellents, provide our rooms with incense to keep them away, and no problems have been reported by guests as yet. Ants are repelled with use of tumeric lines as in India, other scavengers are kept away by clean habits in kitchen etc! Thick walls which act as a good buffer. We are located in Muizenberg, a beachfront suburb of Cape Town. Cape Town has over 3 million people. Train stations 5 minutes walk away - False Bay or Muizenberg on the Simon’s Town/Fish Hoek metro line from Cape Town. From False Bay station, walk away from the mountain along Albertyn Rd, Watson Rd is the sixth road on the right and we are unmissable, one block down. 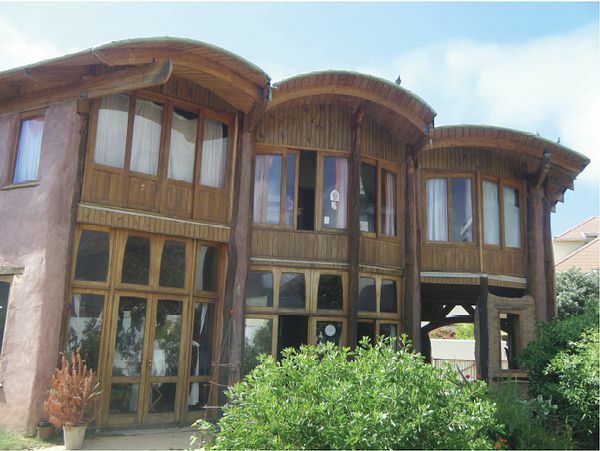 Organic construction with natural curves, including curving wood trusses. Ground clay, ground sand, straw, organically treated timber (alien cleared gum trees). 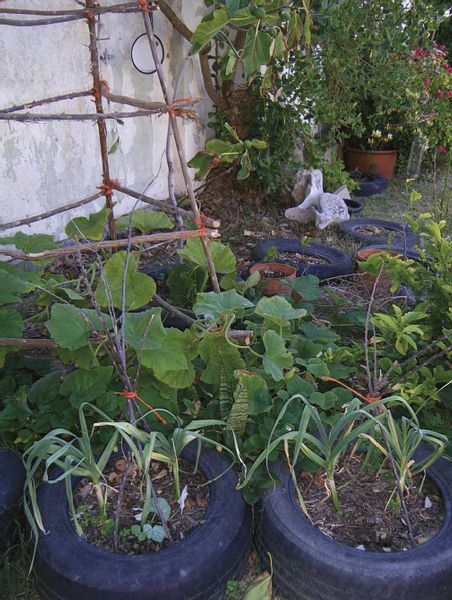 We use plants in our garden which are either entirely local or at least water-wise, our garden wall is constructed from recycled tyres which provide “green security” with the many plants growing from there. Our garden landscape is still somewhat in process after years as a building site - the soil on site being of various kinds according to what was piled there during construction. We also composted our garden areas widely before beginning house construction and continue to garden organically. Not at present, though we do keep an eye on our water bill etc. in peak season. Have not been approached for this yet. Children are half-price, under 2s are free. We do have a discount for pensioners/ students if at least two people (not necessarily both students/pensioners) are staying with us. Unfortunately our guest accommodation is upstairs so we are not wheelchair-friendly. Photo 4m: Unfortunately our guest accommodation is upstairs. Here you can see more locally sourced wood, treated with a locally-developed organic varnish, plus the edges of our plumbing system (locally made and installed) which links from the shower to the grey water system – piping from underground into the garden. We provide an information pack to our guests on responsible tourism actions in the Cape region. This is attached here and also visible on our website. (NO) We aim to contribute to eco-friendly charities as mentioned above once we start making profits, one of our favourites is involved in permaculture gardens in the townships. Photo 4o: Organic market gardeners from the "Harvest of Hope" run by NGO Abalimi Bezekhaya, who we hope to be able to support more once we begin to turn profits. The farmers are trained in organic farming methods (permaculture) in their small township plots, feeding their families, and selling their surplus to the growing number of organic markets in the Cape. In Muizenberg, a beach suburb of Cape Town. We provide information on local activities, restaurants etc. Written brochures, local environmental magazines, books of local interest, oral information from us. We can hire bikes out for those that ask in advance. There are many activities in the Muizenberg area (e.g. surfing, hiking, climbing, live entertainment) but on our own property there is principally the opportunity to relax, including in the garden, and also to learn more about cob building. Registered tour guide for the Western Cape in-house, we run a large variety of private tours via our small company, OffBeat Tours, with an ethical/eco-friendly slant, but also tours taking in local culture and local spiritual/wellness practices. These usually go to the desired tourist sites but take in another more conscious slant and include additional stops that are more ethical/ecofriendly. Photo 5e: Performance at Africa's only free public arts festival, which aims to bring the arts to people who normally cannot afford to attend such things. Simric is shown performing with Mac MacKenzie, the guitar maestro of local "goema" music – his tours have an insider knowledge of what's really worthwhile on the local scene. 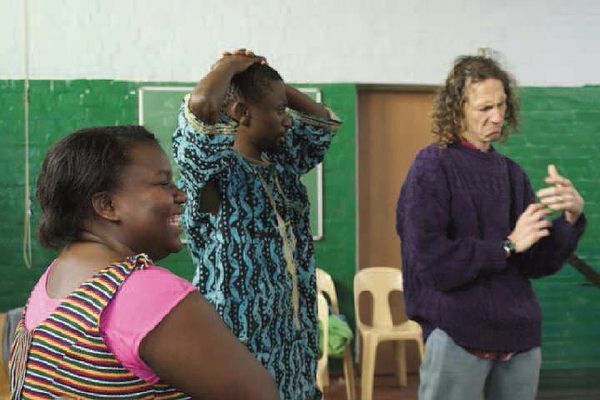 Below is another picture of him working with actors from Jungle Theatre Company, a company producing pieces emphasising environmental consciousness, largely performed for local schoolchildren in diverse communities and settings. Photo 5e2: Another picture of Simric working with actors from Jungle Theatre Company, a company producing pieces emphasising environmental consciousness, largely performed for local schoolchildren in diverse communities and settings. Many practical workshops on cob building, and talks on the process of cob building. Photo 5f: local children's holiday programme which visited our site for a talk on earth-building. 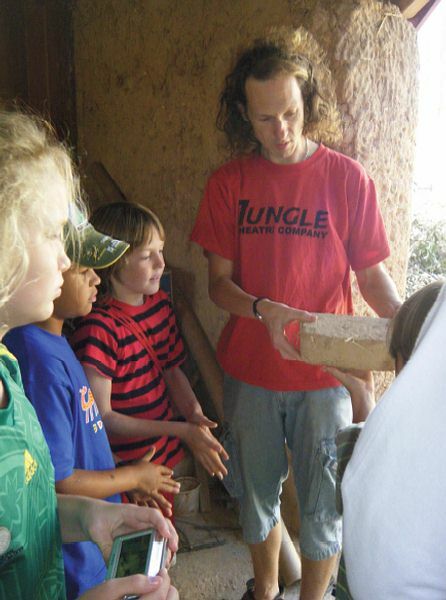 During construction many children got involved in a more hands-on way, but we can still provide plenty of practical information on earth-building for visitors. serves nutritious food etc. ), and we can put families in touch with a number of more conscious school holiday activity providers. None specifically though we have been mentioned in academic works on architecture and energy use. At present, only when needed as occasional back-up support e.g. for checking-in. I hereby declare that all my answers are true and accurate to the best of my knowledge and understand that I and/or my company will not have the right to veto or 'hide' our ECOCLUB.com Rating, which will be decided in the manner specified at http://www.ecoclub.com/ecotourism/rating if we find it unfavourable. I also understand that this rating application is valid for a maximum of 3 Years and a minimum of 1 Year. I may request a new rating application only after 1 Year from the day that my previous rating application was published online. By submitting this questionnaire I indicate acceptance of all ECOCLUB.com Rating terms, conditions and procedures as stated at http://www.ecoclub.com/ecotourism/rating, and understand that these may be modified at any time without notice.